One million children die each year due to severe acute malnutrition (SAM). MANA Nutrition, established in 2009 by CEO Mark Moore, is a nonprofit organization helping to fight this problem. To accomplish this, the company developed a product called MANA: Mother Administered Nutritive Aid. It’s a fortified peanut paste containing vitamins and all of a child's basic nutritional needs. 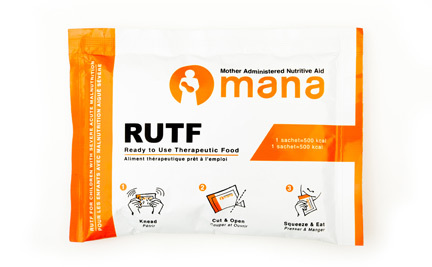 The main focus at MANA Nutrition is ready-to-use therapeutic food (RUTF), meaning there’s no need for water mixing, heating, or refrigeration. As Development Director Tony Hickerson puts it, MANA looks rather like an enlarged ketchup packet, but size can be misleading—just three servings of MANA a day for six weeks can save a malnourished child’s life. Since March 2012, their factory has maintained large-scale production of MANA: about 1,000 cases per day. As a popular phone system for nonprofit organizations, OnSIP has helped make it easy for MANA Nutrition to grow and develop, allowing them to reach more children in need. Troy generously shared his time to tell us about his company and how they use OnSIP. "You guys make it easy. No matter where we are, we're covered," says Troy. About five people work out of MANA’s Charlotte office. Their factory is located in Fitzgerald, Georgia, and employees distribute the product mainly across Africa with the help of the AIDs Organization. Since employees are always out on the road, the company found that it needed a reliable phone service that would accommodate the way they worked. They needed flexibility. With OnSIP, the MANA Nutrition team is now able to contact each other in multiple ways. They use free extension-to-extension dialing, which works regardless of where an employee is physically located. The team also uses the external phone numbers feature, which allows callers to find them when they're away from their OnSIP phones. "When someone is trying to reach us on our extension and we are not there, our cell phones will ring," says Troy. As a nonprofit, any money gained by MANA Nutrition is reinvested back into scaling up production. "OnSIP works for us because it is a cost-efficient way to keep our communications running," says Troy. In addition to using their Polycom 335s, MANA Nutrition hooked up a PA system in their factory that uses OnSIP. To go live across the factory, all one has to do is dial an extension. Since switching to OnSIP from their personal cell phones and basic landlines, MANA employees have enjoyed the easy interface, OnSIP's HD conference suites for group calls, and stellar IT support. Ending severe acute malnutrition is no small task, but MANA Nutrition is committed to that goal. They currently raise awareness through grants, foundations, and even through some consumer products. "In the future, OnSIP can help us with interacting with these fundraising awareness campaign groups," says Troy. "As we ramp up to provide RUTF to more organizations serving kids, we plan to develop a Readiness Program, and we will need a place to convene and share ideas. This is where OnSIP comes into play. Being able to deal with a large scale and having video conferencing will make it easy for us to communicate." Please consider donating to MANA Nutrition, and increase your awareness of severe acute malnutrition. By educating yourself and spreading the word, you are already helping, but you can provide one child with treatment and save a life by donating $55. One hundred percent of all public donations to MANA Nutrition are used to produce more MANA.